This flashy, athletic Wildfire son is as powerfully muscled as they come! Ignite's look, numbers, and pedigree have attracted friends from all over. Ignite is the outcross that we have been looking for. Breeders have been quite pleased with their Ignite calves. There were no calving difficulties reported. 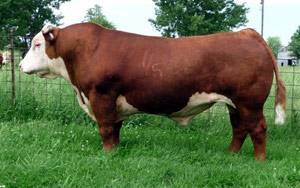 The calves have lots of muscle and rib shape, are short marked, are good haired and extremely attractive. The Ignite calves have been selling extremely well, both the heifer and bull progeny. 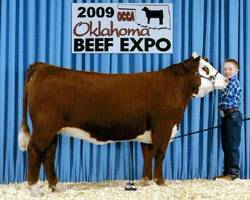 Ignite sired the Reserve Champion Hereford female at both the 2009 Oklahoma Beef Expo and at the 2009 Oklahoma Jr. Hereford Preview show. Ignite is on the Certificate Free program, so you won't need to purchase an AI Certificated on Ignite progeny.